This vintage-inspired ribbon bracelet is delicate while still making an undeniably pristine statement. 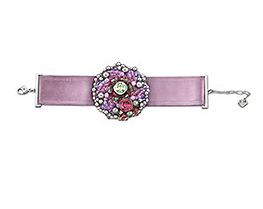 The satin lilac ribbon complements any summer ensemble, and the embellished ornamental motif is what makes this bracelet shine. Bedazzled with pearls, gemmed beads and crystals, this is one bracelet no girl could say “no” to. It would look phenomenal with anything from a sweet summer dress to a sleek summer evening gown. There is no denying this stunning bracelet is a must-have! Calling all bold and beautiful trendsetters: this funky and fresh Raspberry Cherries Necklace is perfect for summer! The glittering necklace is made for the ultimate fashionista who is looking for a fun, new addition to her jewelry collection. Why do we love this pretty necklace? It is super versatile because of the double-sided finish! That’s right, one side sparkles beautifully in a gradation of raspberry-toned crystal colors while the reverse side shimmers and shines in pink epoxy! You can wear the necklace on either side…just pick which side complements your outfit the best. Are you ready to make a serious statement? This chunky, over-sized gemstone ring is just right for the girl who loves her look to be cutting-edge and up-to-the-minute chic. The sharp cut of the stones sends a clear message of confidence and clarity, not to mention the dramatic black framing sets off the whimsical colors of the stones. If your personal style is classic, clean and simple, you will love Swarovski’s Light Rose Earrings. 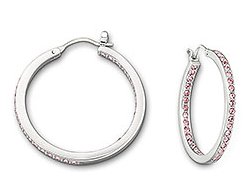 These delicate stainless steel hoop earrings are embellished with light rose crystals, bringing a powerful splash of color to the clean structure. These earrings are traditional, but also have a modern twist to them, making theme the perfect accessory for any summer outfit. This athletic, yet glamorous watch is perfect for summer! 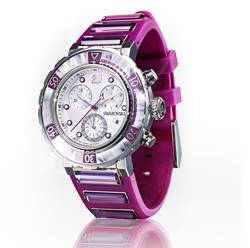 The bold and flexible fuchsia strap is sporty and stylish and perfectly complements the sophisticated silver face. Embellished with luxurious crystal accents, this watch is perfect for the girl who loves sporty styles. Whether you can afford these gorgeous pieces or not, knowing jewelry trends for this summer is essential to looking your best! Which piece from Swarovski’s dazzling collection is your favorite? Leave us a comment and let us know! Wow I love this article. 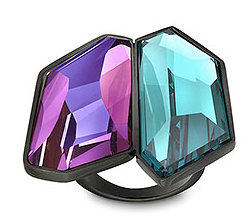 Swarovski has gorgeous accessories and I am thrilled that cg is writing about them. I did not know that Swarovski released new collections just like a real fashion brand would! This is amazing and I am so excited to have learned about this great new collection. Really, really, really awesome article!!!! So great! I am beyond loving this article.....it's honestly the best thing ever!!! !